It’s no secret that your genetics, hormones, sleep, and environment all contribute to the appearance of your skin, but there is another major factor to consider. If you’re feeling like your skin is looking on the dull side of wonderful, or if you’ve been suffering with clogged and problematic skin, it could be your diet. Here's everything you need to know about glowing from the inside out. Healthy skin depends on a regular intake of foods that are rich in alpha and beta-carotene (Vitamin A). Vitamin-A actually helps stimulate the production of collagen, therefore slowing down the normal process of aging. It can also help with inflammatory-prone skin and provides tons of antioxidants. Pumpkin: Just in time for fall! Did you know that one cup of cooked pumpkin puree has over 100% of the recommended daily intake of Vitamin A? Carrots, Winter Squash and Sweet Potatoes: Perfect for roasting and packed with beta-carotene. Leafy Greens: Spinach, Kale, Beet Greens, Chard, Collard Greens, you name it! Throw some greens in a juice or smoothie, lightly sauté them in coconut oil, or just eat them raw. Dandelion Greens: Also a Chinese Herb (Pu Gong Ying), this bitter leaf is especially good for liver detoxification and can be great for acne-prone skin because of its cooling nature. *Getting your required daily intake of Vitamin A from foods is much safer than taking it in supplement form. Emphasis on the "essential" - It's crucial for us to intake foods high in Omega-3 and Omega-6. Why is this? Our bodies cannot produce EFA's on its own! These polyunsaturated fats are the building blocks for healthy cell membranes. They not only can help build a strong immune system, but they also reduce risk of heart disease, stroke, depression, and can reduce inflammation in rheumatoid conditions. With a diet high in these foods, you're sure to keep your skin hydrated and youthful. 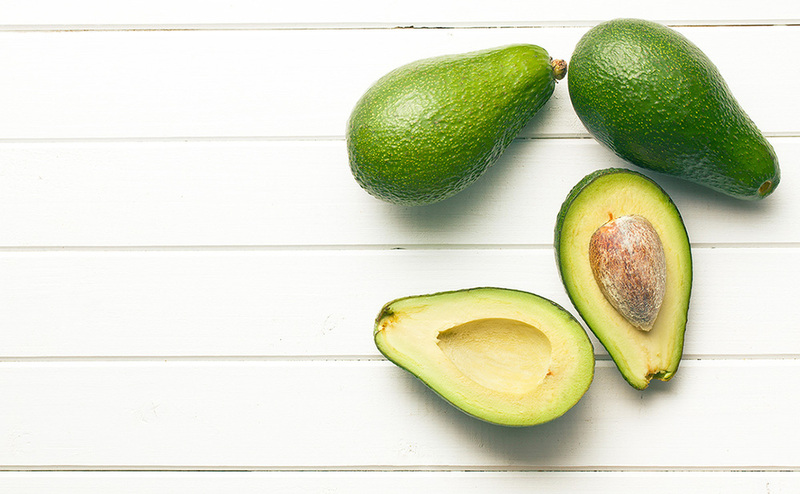 Avocados: This monounsaturated oil-rich fruit is more than just delicious. Cooling in nature, and high in Vitamin E, C and Copper, it's helps build red blood cells while improving the density and general appearance of your skin. Salmon and Mackerel: A great source for brain power. The University of Michigan talks about why cold water fish have a higher Omega-3 fatty acid content than other fish because of their environment and diet. Flax, Chia, and Hemp: These tiny little seeds are jam-packed with nutrients and are the richest source of Omega-3 fatty acids. They greatly reduce pain and inflammation, while having positive influences on the spleen, pancreas and colon. My go-to is throwing a couple tablespoons in a smoothie or mixed in my oatmeal. *Keep flax meal, flax oil, chia seeds, and hemp products stored in the fridge due to them being highly perishable. Walnuts and Almonds: Besides their lubricative effects, walnuts (He Tao Ren in Traditional Chinese Medicine) and almonds are warming in nature and especially good for fall season to alleviate coughing. Walnuts are particularly good for kidney-adrenals and brain function. *Almond skins can irritate the gut lining. To avoid this, soak overnight and peel before eating. Olive Oil: High-quality Olive Oil has a higher antioxidant content. Make sure to always buy cold-pressed, organic olive oil. Probiotics, also known as, 'the good bacteria'! LiveScience explains how keeping a healthy intestinal flora has a direct link to help solve various skin problems. There are many ways of including probiotics into your daily routine. Global Healing Center has a great list of foods you can start eating on a regular basis to help achieve your ideal skin goals. *I highly suggest choosing kefir or yogurt from goat's milk instead of cows milk, especially for problematic complexions. My go-to everyday probiotics are Bio-K and Farmhouse Jalepeño Kraut. I recommend avoiding the following foods to keep breakouts away. Pasteurized dairy products and yogurt that has added sugar. Foods that are greasy, fatty, fried, spicy, or contain refined sugar. Certain seafood: Oyster, herring and shrimp. One of the best things you can do for your body is to muscle down a shot of wheatgrass or E3Live. While it's not the tastiest of treats, your body and skin will thank you. Chlorophyll is the dark green pigment you see in blue-green algae's and leafy greens. The health benefits of chlorophyll are quite impressive, ranging from high amounts of vitamins A, C, E, K, and beta carotene, to containing high levels of antioxidants. Harmful free radicals that we are exposed to on a daily basis won't stand a chance. Dark Leafy Greens: Especially kale, collard greens, and chard. Start every morning off with a glass of warm water with fresh squeezed lemon. This kick-starts your organs for the day and allows them to get a fresh start on purifying your cells while driving out toxins. Drinking enough water is not only crucial for dry skin and acne, it could also be one of the simplest solutions to constipation, bloating, headaches, low energy, and aching muscles. A lot of my patients have a hard time drinking the recommended 8 glasses a day. Here are a couple tricks to stay hydrated and not feel like you're forcing it down. Infused water: Add in some mint, cucumber, lemon, or any other fruit or veggie your prefer to infuse your water. This adds a little flavor while still getting nutrients and hydration. Green tea: Because of the high amounts of antioxidants in green tea, it can slow signs of aging and act as an anti-inflammatory. Internal or topical use of green tea can protect against harmful UV rays and therefore reduce risk of skin cancer.